Bal Keshav Thackeray (IPA: ['ʈʰa:kə'ɾe:]; 23 January 1926 – 17 November 2012) was an Indian politician who founded the Shiv Sena, a Hindu right-wing Marathi ethnocentric party active mainly in the western state of Maharashtra. Holding views attacking Muslims and once praising Adolf Hitler, he was known for his inflammatory writings and was seen as a good orator. A controversial leader, he had a large political influence in the state, especially in Mumbai; his party frequently used violent means against its detractors. Thackeray was blamed for inciting violence against Muslims during the 1992–1993 Bombay riots in the Srikrishna Commission Report, an inquiry by the government. Thackeray began his professional career as a cartoonist with the English language daily The Free Press Journal in Mumbai, but left it in 1960 to form his own political weekly Marmik. His political philosophy was largely shaped by his father Keshav Sitaram Thackeray, a leading figure in the Samyukta Maharashtra (United Maharashtra) movement, which advocated the creation of a separate linguistic state. Through Marmik, he campaigned against the growing influence of non-Marathis in Mumbai. In 1966, Thackeray formed the Shiv Sena party to advocate for the interests of Maharashtrians in Mumbai's political and professional landscape. In the late 1960s and early 1970s, Thackeray built the party by forming temporary alliances with nearly all of state's political parties. Thackeray was also the founder of the Marathi-language newspaper Saamana. After the riots of 1992-3, he and his party took a Hindutva stance. In 1999, Thackeray was banned from voting and contesting in any election for six years on the recommendations of the Election Commission for indulging in seeking votes in the name of religion. Besides getting arrested multiple times and briefly going to jail, Thackeray never faced any major legal repercussions for his actions. Upon his death, he was accorded a state funeral with a large number of mourners present. Thackeray did not hold any official position and never was formally elected as the leader of his party. Thackeray was born in Pune on 23 January 1926 to Ramabai and Keshav Sitaram Thackeray (also known as 'Prabodhankar'). He was the eldest of nine siblings and belonged to the Marathi Chandraseniya Kayastha Prabhu (CKP) community. Keshav was a progressive social activist and writer who was involved in the Samyukta Maharashtra Movement of the 1950s that argued for the creation of a unified state called Maharashtra for Marathi-speaking areas with Mumbai as its capital. Keshav was said to have supported the use of strategic violence as means to achieve that objective and left the movement because of his stance against communists. Keshav's political philosophy inspired Thackeray. Thackeray began his career as a cartoonist in the Free Press Journal in Mumbai. His cartoons were also published in the Sunday edition of The Times of India. In 1960, he launched the cartoon weekly Marmik with his brother Srikant. He used it to campaign against the growing numbers and influence of non-Marathi people in Mumbai, targeting south Indians. After Thackeray's differences with the Free Press Journal, he and four or five people, including politician George Fernandes, left the paper and started their own daily News Day. The paper survived for one or two months. The success of Marmik prompted him to form the Shiv Sena on 19 June 1966. The name "Shiv Sena" (Shivaji's Army) was after the 17th century renowned local Maratha king. Initially, Thackeray said it was not a political party but an army of Shivaji, inclined to fight for the Marathi manoos (person). It demanded that native speakers of the state's local language Marathi (the "sons of the soil" movement) be given preferential treatment in private and public sector jobs. The early objective of the Shiv Sena was to ensure their job security competing against south Indians and Gujaratis. In its 1966 party manifesto, Thackeray primarily blamed south Indians. In Marmik, Thackeray published a list of corporate officials from a local directory, many being south Indians, citing it as proof that Maharashtrians were being discriminated against. His party grew in the next ten years. Senior leaders such as Marathi literature historian Babasaheb Purandare, chief attorney for Trade Union of Maharashtra Madhav Mehere joined the party and chartered architect Madhav Gajanan Deshpande backed various aspects of the party operations. In 1969, Thackeray and Manohar Joshi were jailed after participating in a protest demanding the merger of Karwar, Belgaum and Nipani regions in Maharashtra. During the 1970s, it did not succeed in the local elections and it was active mainly in Bombay, compared to the rest of the state. The party set up local branch offices and settled disputes, complaints against the government. It later started violent tactics with attacks against rival parties, migrants and the media; the party agitated by destroying public and private property. Thackeray publicly supported Indira Gandhi during the 1975 Emergency to avoid getting arrested; Thackeray supported the Congress party numerous times. Politically, the Shiv Sena was anti-communist, and wrested control of trade unions in Mumbai from the Communist Party of India (CPI). Local unemployed youth from the declining textile industry joined the party and it further expanded because of Marathi migrants from the Konkan region. By the 1980s, it became a threat to the ruling Congress party which initially encouraged it because of it rivalling the CPI. In 1989, the Sena's newspaper Saamna was launched by Thackeray. Because of Thackeray being against the Mandal Commission report, his close aide Chhagan Bhujbal left the party in 1991. Following the 1992 Bombay riots, Thackeray took stances viewed as anti-Muslim and based on Hindutva. The SS later allied itself with the Bharatiya Janata Party (BJP). The BJP-Shiv Sena alliance won the 1995 Maharashtra State Assembly elections and were in power from 1995 to 1999. Thackeray declared himself to be the "remote control" chief minister. Thackeray and the Shiv Sena were blamed for inciting violence against Muslims during the 1992–1993 riots in an inquiry ordered by the government of India, the Srikrishna Commission Report. He had influence in the film industry. His party workers agitated against films he found controversial and would disrupt film screenings, causing losses. Bombay, a 1995 film on the riots was opposed by them. On 28 July 1999 Thackeray was banned from voting and contesting in any election for six years from 11 December 1999 till 10 December 2005 on the recommendations of the Election Commission for indulging in corrupt practice by seeking votes in the name of religion. In 2000, he was arrested for his role in the riots but was released because the statute of limitations expired. In 2002, Thackeray issued a call to form Hindu suicide bomber squads to take on the menace of terrorism. In response, the Maharashtra government registered a case against him for inciting enmity between different groups. At least two organisations founded and managed by retired Indian Army officers, Lt Col Jayant Rao Chitale and Lt Gen. P.N. Hoon (former commander-in-chief of the Western Command), responded to the call with such statements as not allowing Pakistanis to work in India due to accusations against Pakistan for supporting attacks in India by militants. After the six-year voting ban on Thackeray was lifted in 2005, he voted for the first time in the 2007 BMC elections. Eight or nine cases against Thackeray and Saamna for inflammatory writings were not investigated by the government. In 2006, Thackeray's nephew Raj Thackeray broke away from Shiv Sena to form the Maharashtra Navnirman Sena (MNS) during Thackeray's retirement and appointment of his son, Uddhav rather than Raj as the leader of Shiv Sena. Narayan Rane also quit around that time. The Sena acted as a "moral police" and opposed Valentine's Day celebrations. On 14 February 2006, Thackeray condemned and apologised for the violent attacks by its Shiv Sainiks on a private celebration in Mumbai. "It is said that women were beaten up in the Nallasopara incident. If that really happened, then it is a symbol of cowardice. I have always instructed Shiv Sainiks that in any situation women should not be humiliated and harassed." Thackeray and the Shiv Sena remained opposed to it, although they indicated support for an "Indian alternative." In 2007, he was briefly arrested and let out on bail after referring to Muslims as "green poison" during a Shiv Sena rally. On 27 March 2008, in protest to Thackeray's editorial, leaders of Shiv Sena in Delhi resigned, citing its "outrageous conduct" towards non-Marathis in Maharashtra and announced that they would form a separate party. Addressing a press conference, Shiv Sena's North India chief Jai Bhagwan Goyal said the decision to leave the party was taken because of the "partial attitude" of the party high command towards Maharashtrians. Goyal further said "Shiv Sena is no different from Khalistan and Jammu and Kashmir militant groups which are trying to create a rift between people along regional lines. The main aim of these forces is to split our country. Like the Maharashtra Navnirman Sena, the Shiv Sena too has demeaned North Indians and treated them inhumanely." Thackeray died on 17 November 2012 as a consequence of a cardiac arrest. Mumbai came to a virtual halt immediately as the news broke out about his death, with shops and commercial establishments shutting down. The entire state of Maharashtra was put on high alert. The police appealed for calm and 20,000 Mumbai police officers, 15 units of the State Reserve Police Force and three contingents of the Rapid Action Force were deployed. It was reported that Shiv Sena workers forced shops to close down in some areas. The then Prime Minister Manmohan Singh called for calm in the city and praised Thackeray's "strong leadership", while there were also statements of praise and condolences from other senior politicians such as the then Gujarat Chief Minister Narendra Modi and the BJP leader and MP, L. K. Advani. He was accorded a state funeral at Shivaji Park, which generated some controversy and resulted from demands made by Shiv Sena. It was the first public funeral in the city since that of Bal Gangadhar Tilak in 1920. Thackeray's body was moved to the park on 18 November. Many mourners attended his funeral, although there were no official figures. The range reported in media sources varied from around 1 million, to 1.5 million and as many as nearly 2 million. His cremation took place the next day, where his son Uddhav lit the pyre. Among those present at his cremation were senior representatives of the Maharashtra government and the event was broadcast live on national television channels. The Parliament of India opened for its winter session on 21 November 2012. Thackeray was the only non-member to be noted in its traditional list of obituaries. He is one of few people to have been recorded thus without being a member of either the Lok Sabha or the Rajya Sabha. Despite having not held any official position, he was given the 21-gun salute, which was again a rare honour. Both houses of Bihar Assembly also paid tribute. The funeral expenses created further controversies when media reports claimed that the BMC had used taxpayers' money. In response to these reports, the party later sent a cheque of Rs. 500,000 to the Corporation. The Hindu, in an editorial, said regarding the shutdown that "Thackeray’s legion of followers raised him to the status of a demigod who could force an entire State to shut down with the mere threat of violence". Following his death, police arrested a 21-year-old woman who posted a Facebook comment against him, as well as her friend who "liked" the comment. Shiv Sena members also vandalised the clinic owned by the woman's relative. Thackeray was called 'Balasaheb' and Hindu Hruday Samraat ("Emperor of Hindu Hearts") by his supporters. His yearly address at Shivaji Park was popular among his followers. In 2012, he instead gave a video-taped speech and urged his followers "to give the same love and affection to his son and political heir Uddhav as they had given him". Thackeray was known to convert popular sentiment into votes, getting into controversies and making no apologies for it though his son has tried to tone down the party's stance after his death. He was known for his inflammatory writings, was seen as a good orator who used cruel humour to engage his audience. He had a large political influence throughout the state, especially in Mumbai. His party never had an formal internal elections nor was he ever formally elected as its chief at any point. Gyan Prakash said, "Of course, the Samyukta Maharashtra Movement had mobilized Marathi speakers as a political entity, but it was Thackeray who successfully deployed it as an anti-immigrant, populist force." Following Thackeray's death in 2012, the Pakistani newspaper Express Tribune published an editorial defining him as a "bigot" who instigated racism and violence against Muslims. A memorial for him was proposed at Shivaji Park but legal issues and opposition from local residents continue to delay it. Thackeray is satirised in Salman Rushdie's 1995 novel The Moor's Last Sigh as 'Raman Fielding'. The book was banned by the Maharashtra state government. Suketu Mehta interviewed Thackeray in his critically acclaimed, Pulitzer-nominated, non-fiction 2004 book Maximum City. Thackeray previewed director Ram Gopal Verma's film Sarkar, which is loosely based on him, released in 2005. The 2011 documentary Jai Bhim Comrade depicted a speech by Thackeray at a public rally, in which he articulated "genocidal sentiments" about Muslims, stating that they were the "species to be exterminated." The documentary followed this by showing several Dalit leaders criticizing Thackeray for his beliefs. Thackeray was married to Meena Thackeray (née Vaidya) and had three sons, Bindumadhav, Jaidev and Uddhav. Meena died in 1995 and Bindumadhav died the next year in a car accident. Raj Thackeray is his brother Srikant's son. Despite Raj's breakaway from the main party, Raj continues to maintain that Thackeray was his ideologue and relations between them improved during Thackeray's final years. Thackeray drew cartoons for Marmik and contributed to Saamna till 2012. He cited the British cartoonist David Low as his inspiration. He was fond of beer and cigars. Thackeray was criticised for his praise of Adolf Hitler which he later neither admitted nor denied. He was quoted by Asiaweek as saying: "I am a great admirer of Hitler, and I am not ashamed to say so! I do not say that I agree with all the methods he employed, but he was a wonderful organiser and orator, and I feel that he and I have several things in common...What India really needs is a dictator who will rule benevolently, but with an iron hand." However, Indian Express published an interview 29 January 2007: "Hitler did very cruel and ugly things. But he was an artist, I love him [for that]. He had the power to carry the whole nation, the mob with him. You have to think what magic he had. He was a miracle...The killing of Jews was wrong. But the good part about Hitler was that he was an artist. He was a daredevil. He had good qualities and bad. I may also have good qualities and bad ones." Thackeray also declared that he was "not against every Muslim, but only those who reside in this country but do not obey the laws of the land...I consider such people [to be] traitors." The Shiv Sena is viewed by the liberal media as being anti-Muslim, though Shiv sena members officially reject this accusation. When explaining his views on Hindutva, he conflated Islam with violence and called on Hindus to "fight terrorism and fight Islam." In an interview with Suketu Mehta, he called for the mass expulsion of illegal Bangladeshi Muslim migrants from India and for a visa system to enter Mumbai, the Indian National Congress state government had earlier during the Indira Gandhi declared national emergency considered a similar measure. He told India Today "[Muslims] are spreading like a cancer and should be operated on like a cancer. The...country should be saved from the Muslims and the police should support them [Hindu Maha Sangh] in their struggle just like the police in Punjab were sympathetic to the Khalistanis." However, in an interview in 1998, he said that his stance had changed on many issues that the Shiv Sena had with Muslims, particularly regarding the Babri Mosque or Ram Janmabhoomi issue: "We must look after the Muslims and treat them as part of us." He also expressed admiration for Muslims in Mumbai in the wake of the 11 July 2006 Mumbai train bombings perpetrated by Islamic fundamentalists. In response to threats made by Abu Azmi, a leader of the Samajwadi Party, that accusations of terrorism directed at Indian Muslims would bring about communal strife, Thackeray said that the unity of Mumbaikars (residents of Mumbai) in the wake of the attacks was "a slap to fanatics of Samajwadi Party leader Abu Asim Azmi" and that Thackeray "salute[s] those Muslims who participated in the two minutes' silence on July 18 to mourn the blast victims." Again in 2008 he wrote: "Islamic terrorism is growing and Hindu terrorism is the only way to counter it. We need suicide bomb squads to protect India and Hindus." He also reiterated a desire for Hindus to unite across linguistic barriers to see "a Hindustan for Hindus" and to "bring Islam in this country down to its knees." In 2008, following agitation against Biharis and other north Indians travelling to Maharashtra to take civil service examinations for the Indian Railways due to an overlimit of the quota in their home provinces, Thackeray also said of Bihari MPs that they were "spitting in the same plate from which they ate" when they criticised Mumbaikars and Maharashtrians. He wrote: "They are trying to add fuel to the fire that has been extinguished, by saying that Mumbaikars have rotten brains." He also criticised Chhath Puja, a holiday celebrated by Biharis and those from eastern Uttar Pradesh, which occurs on six days of the Hindu month of Kartik. He said that it was not a real holiday. This was reportedly a response to MPs from Bihar who had disrupted the proceedings of the Lok Sabha in protest to the attacks on North Indians. Bihar Chief Minister Nitish Kumar, upset with the remarks, called on the prime minister and the central government to intervene in the matter. A Saamna editorial prompted at least 16 MPs from Bihar and Uttar Pradesh, belonging to the Rashtriya Janata Dal, Janata Dal (United), Samajwadi Party and the Indian National Congress, to give notice for breach of privilege proceedings against Thackeray. After the matter was raised in the Lok Sabha, Speaker Somnath Chatterjee said: "If anybody has made any comment on our members' functioning in the conduct of business in the House, not only do we treat that with the contempt that it deserves, but also any action that may be necessary will be taken according to procedure and well established norms. Nobody will be spared.'" In 2009, he criticised Marathi cricketer Sachin Tendulkar for saying he was an Indian before he was a Maharashtrian. 1 2 3 4 5 6 7 "The Firebrand Who Renamed Bombay: Bal Thackeray (1926–2012)". Nov. 17, 2012 Time World. 17 November 2012. Retrieved 14 June 2013. 1 2 3 Kaminsky, Arnold P.; Long, Roger D. (2011). India Today: An Encyclopedia of Life in the Republic (illustrated ed.). ABC-CLIO. pp. 693–4. ISBN 978-0-313-37462-3. 1 2 3 The New York Times (2012-11-18). "Hundreds of Thousands Mourn Indian Politician Thackeray". The New York Times. ISSN 0362-4331. Retrieved 2016-02-08. 1 2 3 4 5 6 7 8 9 10 11 12 "Bal Thackeray's political career - BBC News". BBC News. Retrieved 2016-01-29. 1 2 3 4 5 6 7 8 9 10 11 "Leader who brought ethnic politics to Mumbai melting pot". The Hindu. 2012-11-17. ISSN 0971-751X. Retrieved 2016-01-30. ↑ "India". WAN-IFRA. Archived from the original on 2015-04-10. Retrieved 30 September 2012. ↑ "Milestones in the life of Sena chief Bal Thackeray". hindustantimes. HT Media Limited. Archived from the original on 20 November 2012. Retrieved 2 November 2014. ↑ "Comparative Studies of South Asia, Africa and the Middle East". South Asia Bulletin. University of California, Los Angeles. 16 (2): 116. 1996. Retrieved 15 November 2012. 1 2 3 Gyan Prakash (21 September 2010). Mumbai Fables. Princeton University Press. pp. 228–237. ISBN 978-0-691-15317-9. Retrieved 4 December 2012. ↑ "Why no one dared to mess with Shiv Sena? : Special Report - India Today". indiatoday.intoday.in. Retrieved 2016-02-09. ↑ "Obituary: Bal Thackeray-the tiger who ruled Mumbai : Bal Thackeray, News - India Today". indiatoday.intoday.in. Retrieved 2016-02-11. 1 2 3 Bahree, Megha. "Thackeray Controlled Mumbai for Four Decades". Wall Street Journal. ISSN 0099-9660. Retrieved 2016-02-08. ↑ Madhav Godbole (1 January 1996). Unfinished Innings: Recollections and Reflections of a Civil Servant. Orient Blackswan. p. 414. ISBN 978-81-250-0883-5. Retrieved 4 December 2012. ↑ "The Shiv Sena indicted". Frontlineonnet.com. Archived from the original on 28 March 2013. Retrieved 2013-06-14. ↑ "Thackeray votes after expiry of ban". Hindustan Times. 2004-04-26. Archived from the original on 2014-01-11. Retrieved 2013-06-14. ↑ "Thackeray for Hindu suicide squads". Times of India. 15 October 2002. Retrieved 2013-06-27. ↑ "Case filed against Thackeray for urging anti-terror suicide-squads". ExpressIndia.com. Archived from the original on 30 September 2007. Retrieved 25 August 2007. ↑ "Despite Sena threat, 'MNIK' opens to packed theatres across country". TOI. 12 February 2010. Retrieved 28 February 2010. ↑ "An open letter to Uddhav Thackeray". IBN. 12 February 2010. Retrieved 17 November 2012. ↑ "Thackeray ke Bal par...". Mid Day. Archived from the original on 18 October 2009. Retrieved 14 October 2009. ↑ "Sena fate: From roar to meow". The Times of India. 29 November 2005. Retrieved 11 August 2006. ↑ "On the wrong track". The Hindu. Retrieved 11 August 2006. ↑ "Diversionary tactics". The Hindu Frontline Magazine. Retrieved 8 August 2008. 1 2 Mishra, Ambarish (19 November 2012). "राज महायात्रेत अलिप्त होते, कारण...". Maharashtra Times (in Marathi). Retrieved 20 November 2012. ↑ "Thackeray condemns V-Day attacks by Sainiks". Mumbai: The Times of India. PTI. 18 February 2006. Retrieved 13 November 2012. ↑ PTI 13 Feb 2006, 08.55pm IST (13 February 2006). "Thackeray suggests Indian version of V-Day — Times Of India". The Times of India. Retrieved 13 November 2012. ↑ "Right-wing to go easy on couples this Valentine's Day". NDTV.com. 1 2 "Shiv Sena's North Indian leaders quit". The Times of India. 27 March 2008. Retrieved 4 April 2008. ↑ "Delhi Shiv Sena chief resigns". Chennai, India: The Hindu. 28 March 2008. Archived from the original on 2 April 2008. Retrieved 4 April 2008. ↑ Mumbai Bureau (15 November 2012). 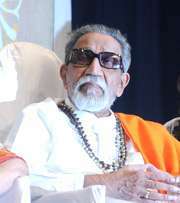 "States / Other States : Bal Thackeray passes away; funeral on Sunday". Chennai, India: The Hindu. Retrieved 19 November 2012. ↑ Mankikar, Sayli Udas; Ghoge, Ketaki (18 November 2012). "Mumbai shuts down as Bal Thackeray makes final journey today". Hindustan Times. Mumbai, India. Archived from the original on 18 November 2012. Retrieved 18 November 2012. ↑ "Security beefed up across Maharashtra". DNA India. PTI. Retrieved 17 November 2012. ↑ "Traders bandh in Maharashtra tomorrow to pay homage to Bal Thackeray". Hindustan Times. PTI. 18 November 2012. Archived from the original on 18 November 2012. Retrieved 19 November 2012. ↑ Jain, Bharti (20 November 2012). "State funeral: CM went by people's sentiments". The Times of India. Retrieved 3 August 2013. ↑ "Thackeray funeral at 'public ground' Shivaji Park sparks debate". DNA India. 19 November 2012. Retrieved 7 December 2012. ↑ Mankikar, Sayli Udas (19 November 2012). "Demand for Thackeray memorial at Shivaji Park". Hindustan Times. Archived from the original on 28 November 2012. Retrieved 7 December 2012. ↑ "State funeral for Bal Thackeray, calm city lines up". financialexpress. Archived from the original on 29 October 2013. Retrieved 29 May 2013. ↑ "Bal Thackeray passes away: Mumbai remains shut". Economic Times. 18 November 2012. Retrieved 19 November 2012. ↑ "Maha end to Tiger journey". Deccan Chronicle. 19 November 2012. Archived from the original on 11 January 2013. Retrieved 19 November 2012. ↑ "Mumbai returns to normal after Bal Thackeray funeral". BBC. 19 November 2012. Retrieved 30 November 2012. ↑ "Nearly 20 lakh people join the funeral procession of Shiv Sena supremo Bal Thackeray as Mumbai comes to a standstill". India Today. 18 November 2012. Retrieved 19 November 2012. ↑ "Shiv Sena chief Bal Thackeray cremated, Uddhav lights funeral pyre". Zee News. 19 November 2012. Retrieved 7 December 2012. ↑ "Bal Thackeray's funeral procession gets massive live TV coverage". The Times of India. IANS. 19 November 2012. Retrieved 7 December 2012. ↑ "Bal Thackeray only non-MP to get obituary reference in Parliament". DNA India. IANS. 22 November 2012. Retrieved 7 December 2012. 1 2 "Shiv Sena pays Rs 5 lakh for Bal Thackeray's funeral expenses". May 24, 2013. Zee Media Bureau. Retrieved 29 May 2013. ↑ "Bihar Assembly pays tribute to Bal Thackeray". Zeenews.india.com. 2012-11-29. Retrieved 2013-06-14. ↑ PTI (2012-11-29). "Bihar assembly pays tribute to Sena chief Bal Thackeray". News.in.msn.com. Retrieved 2013-06-14. ↑ "Bihar Assembly pays tribute to Shiv Sena chief Bal Thackeray". Ibnlive.in.com. Retrieved 2013-06-14. ↑ "A troubling legacy". The Hindu. 2012-11-19. ISSN 0971-751X. Retrieved 2016-02-07. ↑ Kaphle, Anup (2012-11-19). "Who was Bal Thackeray and why did Mumbai come to a standstill this weekend?". The Washington Post. ISSN 0190-8286. Retrieved 2016-02-07. ↑ "Bal Thackeray - The Express Tribune". The Express Tribune. Retrieved 2016-01-29. ↑ Purandare, Vaibhav (2013-02-27). Bal Thackeray and the rise of Shiv Sena. Roli Books Private Limited. pp. 23–27. ISBN 9788174369918. ↑ Burns, John F. (2 December 1995). "New Delhi Journal; Another Rushdie Novel, Another Bitter Epilogue". The New York Times. Retrieved 17 November 2012. ↑ "A political saga of a cartoonist". Andhra Wishesh. 15 November 2012. Retrieved 17 November 2012. ↑ IANS (17 November 2012). "Shiv Sena chief Bal Thackeray passes away". IANS. Retrieved 17 November 2012. ↑ iPad iPhone Android TIME TV Populist The Page. "TIME Magazine — Asia Edition — November 19, 2012 No. 21". Asiaweek.com. Retrieved 13 November 2012. ↑ "Sorry". Indianexpress.com. Retrieved 13 November 2012. ↑ Sherman Hollar (23 January 1927). "Bal Thackeray (Indian journalist and politician)". Britannica Online Encyclopedia. Retrieved 15 November 2012. ↑ "Know your party: Shiv Sena — Lok Sabha Election 2009". In.rediff.com. 23 April 2004. Retrieved 31 March 2012. ↑ "Thackeray lashes out at Prez again". Ibnlive.com. 3 February 2007. Retrieved 15 November 2012. ↑ Mihir Bose (2006). The Magic of Indian Cricket: Cricket And Society in India. Taylor & Francis Group. p. 88. ISBN 978-0-415-35691-6. Retrieved 4 December 2012. ↑ Suketu Mehta (27 September 2005). Maximum City. Random House Digital, Inc. p. 101. ISBN 978-0-375-70340-9. Retrieved 17 November 2012. ↑ Bal Thackeray in India Today, Shiv Sena leader of Bombay, June 15, 1984. 1 2 "The Rediff Interview/ Bal Thackeray". Rediff.com. 21 January 1998. Retrieved 15 November 2012. ↑ "Mumbai's unity a slap to fanatics: Thackeray". The Times Of India. 20 July 2006. ↑ Leaders deliver hate speech with impunity. IBNLive, 7 April 2009. ↑ "Hindustan of Hindus my dream: Thackeray". Indian Expres. 29 January 2007. Retrieved 20 November 2012. 1 2 3 4 "Rattled by Raj, Thackeray abuses Biharis news". The Indian Express. Retrieved 2 February 2008. Mahārāva, Jñāneśa (2001). Thackeray, life & style. Pushpa Prakashan. ISBN 978-81-7448-092-7. Wikimedia Commons has media related to Bal Thackeray. Profile: Bombay's militant voice by BBC dated 19 July 2000 referring to him as the "uncrowned monarch of Maharashtra"